Although they are a fairly common health condition, tonsil stones can have adverse effects on a person’s self-esteem because of the unpleasant symptoms they may create. Your tonsils are two oval-shaped lymphatic organs that are positioned on either side of the back of your throat. Tonsil stones occur when debris such as food particles, dead cells, and microorganisms accumulate on the surface of the palatine tonsils. This debris can combine with mucus and begin to decay. If the accumulation is not dealt with, it will calcify into small, hardened tonsil stones. Although most tonsils stones are relatively small and asymptomatic, some people suffer from large and bothersome tonsils stones. Large tonsil stones can create unpleasant symptoms, such as earaches, a chronic sore throat, difficulty swallowing, and persistent bad breath. These symptoms can lead to self-esteem issues as some patients to struggle in their daily activities, especially if they are self-conscious of their bad breath. 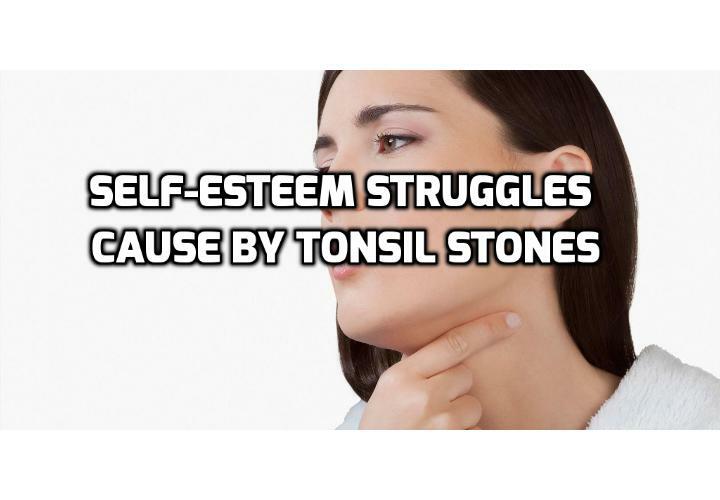 Self-esteem issue such as bad breath is a side effect of tonsil stones that can be difficult to treat. Tonsil stones contain decaying debris that attracts sulfur-producing bacteria. When tonsil stones combine with volatile sulfur compounds that are produced by oral bacteria, an unpleasant smell is created. Additionally, tonsil stones often contain mucus from postnasal drip, which facilitates tonsil-stone decay and worsens any existing oral odor. In addition to tonsil stones, persistent tonsil infections can also lead to bad breath and create embarrassment for patients. One study of individuals with chronic tonsillitis found that 75% of people with abnormally high breath-concentrations of smelly sulfuric compounds also suffered from tonsil stones. Because tonsil stones often occur in those with persistent tonsillitis, bad breath may worsen in those who experience both conditions. If you are concerned about your breath or about other complications associated with tonsil stones, see your doctor. He or she can remove any visible tonsil stones during your visit and may suggest treatments such as an antibiotic or gargling with salt water. If your symptoms or concern persists, your doctor may refer you to an ear, nose, and throat specialist for more-intensive treatment options. If your bad breath and concerns are still causing you discomfort, you may benefit from seeking psychological advice from a certified professional. Previous PostPrevious How to Really Prevent Persistent Tonsil Stones? Next PostNext What is the Link between Size and Shape of Tonsils and Tonsil Stones Formation?